With over 75 years of combined experience, our team is experienced, skilled and dedicated to design top quality systems for your home or business. SunPV Energy’s team is Knowledgeable, Experienced and highly Skilled in the renewable technologies. We offer sustainable and cost-effective solutions no matter how big or small the project for your home or business. A renewable energy enthusiast who rediscovered himself to the field post his tenure in various high technology companies like Toshiba, ABB, GE Medical Systems, Whirlpool, Jabil, Onida etc. 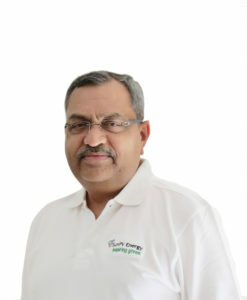 Held various positions during his career as Engineering Manager, General Manager, Engineering Director and CTO. Ravi holds a Masters degree in Electrical Engineering from IIT Mumbai. A strategist who can make the world look simple. 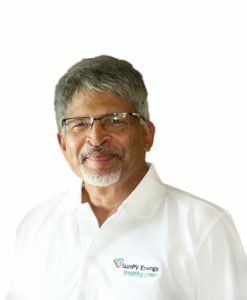 He is passionate about renewable energy and has over 30 years of experience in high technology companies like Microsoft, Oracle and Accenture. He has held various senior positions during his career as head of business with revenue and growth responsibilities. Susheel is qualified in Business Management and Foreign Trade. A planner and a progressive thinker by nature. 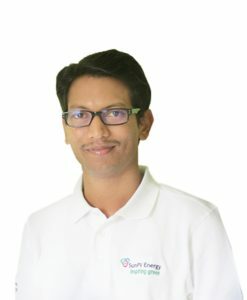 He is passionate about entrepreneurship and renewable energy, Rakshith received his BE in Mechanical Engineering from VTU and has an expertise experience in all types cooperate operations. While having a valuable experience of operational activities he lead out with all core and day to day operations. His experience in multiple fields helps him draw his knowledge in managing operational activities with ease. 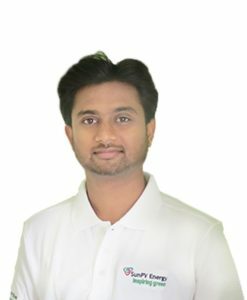 Driven by design and creativity, passionate about entrepreneurship and renewable energy, he has valuable experience in renewable energy and worked in both MNC and startups. He speaks through his designs and thoughts, always in a constant search for perfection. He has done BE in ‘Mechanical Engineering’ VTU, and PG diploma in ‘Entrepreneurship and Business Management’ in collaboration of EDI, India and Friedrich University, Germany. Venu has over 20 years of rich experience both in Electronics and Electrical appliances and installations industry. 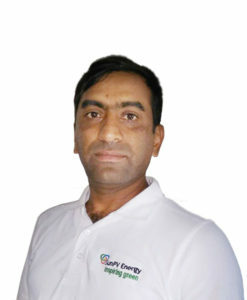 Having worked in the Consumer Electronics and Telecom sectors, Venu brings with him the invaluable eye for detail in every SunPV solar installation. He is the go-to person for every customer support issue and his commitment to serve our customers is commendable. Venu manages our Installation, Support and Service escalation portfolio. SunPV Energy’s vision is to contribute positively to a sustainable lifestyle. We strive to increase reliance on clean and abundant renewable energy by providing world class customized renewable energy solutions. We ensure a professional customer experience with high-quality installation. A. Fulfill our commitments to homeowners, employees, Installers, technicians and vendors. B. Strive for the best & most optimum solutions. C. Respect and empower each other. A.Produce results that are worth more then they cost to deliver. B. Obsessively reduce cycle times. C. Stay lean-eliminate unnecessary costs. B. Don’t hesitate to try new things. The quality of our workmanship is second only to our outstanding level of customer care and customer service and that commitment of going above and beyond? We incorporate that into every aspect of our business. We work closely with our customers to find the best-fit solution, we deliver what we promise. When you call, we answer. When SunPV Energy is on the job, consider us as your partner. No matter how big or how small the renewable energy project, SunPV Energy offers you a broad range of design & installation services as well as the expertise and teamwork to get the job done right the first time. When you work with SunPV Energy, you are truly getting a custom sustainable solution tailored made specifically to your needs and your actual site location.